Grilled cheeses, without the bread! Why not include grilling cheeses in your grilled cheese month celebrations? Halloumi is one if the oldest Cypriot cheeses worthy of celebration, as is saganaki, the ultimate grilled cheese that you typically see doused in ouzo, lit on fire in Greek restaurants everywhere. Take a break from bread and grill some cheese! From mythology it is said that the Gods sent Aristaeo , the son of Apollo and Cyrene to teach the Greeks the art of cheesemaking, This was intended as a “Gift from the Gods”, an ability that would become known as “a gift of everlasting value.” Homer’s Odyssey tells us about the Cyclops Polyphymus and his cheesemaking where he gives descriptions of the cheeses that were maturing in his cave. The cheese that was prepared by Polyphemus and described in the Odyssey is considered to be the ancestor of Feta. Feta is indeed a gift from the Gods, one of my staple cheeses that accompanies me in my daily journey through life. Do yourself a favour, make the Gods and Goddesses of Ancient Greece happy, and get yourself some divine barrel aged Feta, a fresh, brined and aged cheese from the mountains in Greece. Ok, I have a confession to make, I *just* made my first scratch mac & cheese. Ever. Kind of ridiculous given my interest in all things cheese, I like to cook and eat, so go figure. 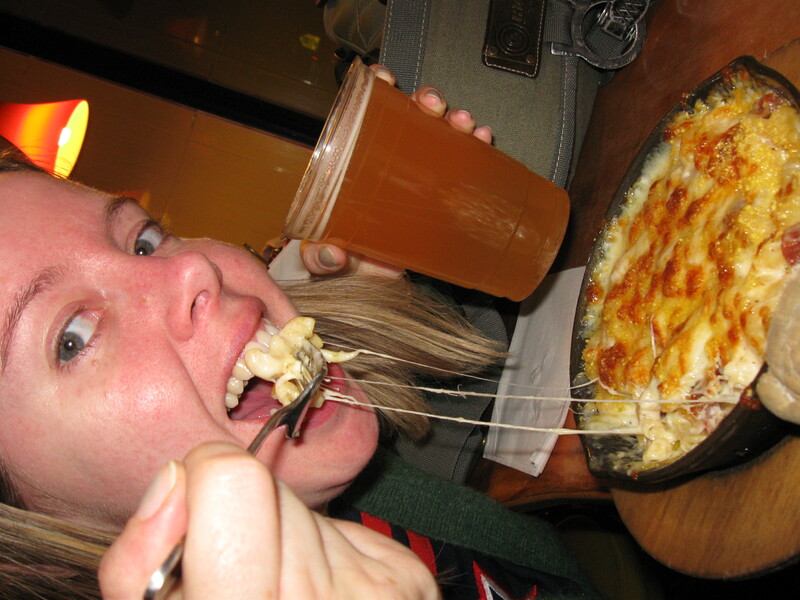 I eat it dining out plenty; to date my best mac & cheese experience was at S’MAC (Surita’s Mac & Cheese) http://www.smacnyc.com/. One of those life changingly good meals. I had the alpine version which was Gruyere and slab bacon. So incredibly delicious! So, both this site and my email had mysteriously been down for a few days, (back online now, clearly) and I was extremely stressed about that situation, so I decided it was time to recreate the mac & cheese love, as cheese is known to actually help you feel better in times of stress. Cheese makes us feel good because it contains relatively high concentrations of tyrosine, a chemical building block of many important neurotransmitters, among them several of the brain’s “feel good” substances. Studies show that tyrosine is helpful during periods of stress, cold, fatigue, prolonged work and sleep deprivation. I am generally sleep deprived. It also appears to improve cognitive and physical performance. Neurologists have stated that cheese may be one of the most perfect foods to capture the nutritional-emotional duality. If your mood is neutral and you ingest tyrosine, you aren’t likely to experience a noticeable change, but if you are in a stressful period (as I was), it is possible that increasing tyrosine intake can improve your mood. During stressful times you lose chemicals that are necessary for feelings of comfort or well being, so by taking tyrosine, you build them back up. You may be wondering where I got that information – its all in my old Cheese Nutrition presentation from a few years ago. I also had a significant amount of cheese in the fridge to use up, which is hardly new. So, I found a fairly simple recipe online, ignored their cheese suggestion and selected some of my cheeses; Le Marechal, a modern alpine style Swiss cheese – sweet, nutty, hints of condensed cooked milk, altogether savoury and delicious. Then I grated up some Pleasant Ridge Reserve, on of my favourite American artisan cheeses made by the Uplands Cheese Company, it fruity, rich, nutty and grassy. The recipe for this cheese was originally modelled after Beaufort, and Uplands Cheese Company pays respectful homage to the classic while making it truly their own cheese of beauty. I also added Graviera Kritis, a Greek cheese made from primarily sheep milk but up to 20% goat. The milk for this cheese comes from animals that are allowed to graze freely on mountainous regions in Crete. Nutty, grassy notes are pronounced in this cheese. I also put a little bit of this lovely farmstead Gouda brought back to me by a colleague’s visit to Holland. She visited a farm, and brought it directly to the office for me, (thank you Tina!!) I’m quite grateful for her thoughtful gift, the flavour profile in this cheese is nutty, grassy, fruity, milky, toasty caramel. It is delicious. And finally, I shredded some 3 year old cheddar and added that to the mix, a nice balanced cheese, sweetness and salty in check. You can see where I’m going with this – nutty, grassy flavours reminiscent of alpine cheeses (think Gruyere, Emmental) but adapted to the contents of my fridge. 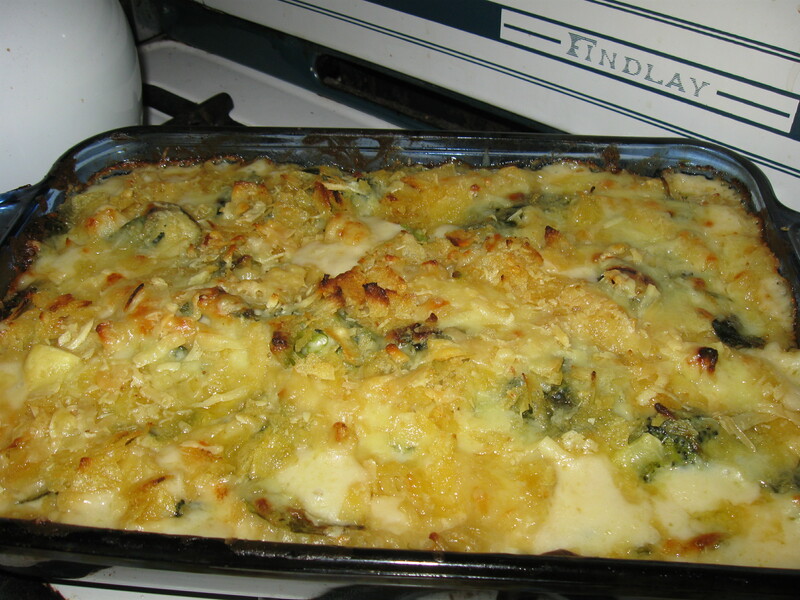 Ultimately, the dish turned out fine, but the recipe called for 2 cups of cheese – I added 3, but even then I found it insufficient, given that there were also 3 cups of milk. The base recipe was good for a base starting point, but left a lot of room for improvement, even with my (better) cheeses. I added vegetables to make it a little healthier, while still being decadent. I would certainly add more cheese, perhaps less milk, more seasoning, but another revision I will continue with is using crushed regular potato chips on top in lieu of breadcrumbs. That totally worked out well! Nice crunch, nice hit of salt, move over buttered bread crumbs, this was fantastic and dead easy! Overall, my quest for perfect homemade mac & cheese love has inspired me to try again, take another stab at it, and mix it up. Until the results are on par with the memory of my S’MAC experience, the quest continues. Manouri is a fresh white cheese with PDO status made from the drained whey in feta production. Very creamy, low in salt, this cheese is excellent for use in both savoury and sweet applications. What is PDO Status you might ask? PDO: Protected Designation of Origin (the initials are the same in some cases, translated into other languages, and in France, it is AOC – Appelation d’Origine Controllee (pardon my lack of proper accents)). The origin – the milk is produced and the cheese is made in a precise geographical region. That traditional cheesemaking methods are employed which usually go back thousands of years, (i.e. produce by season, bury underground, etc) resulting in a unique character for that cheese. The governing country guarantees authenticity and quality; producers submit to approval by a commission. In short, a PDO or AOC or DO certified cheese is an indication of quality, imitators need not apply.